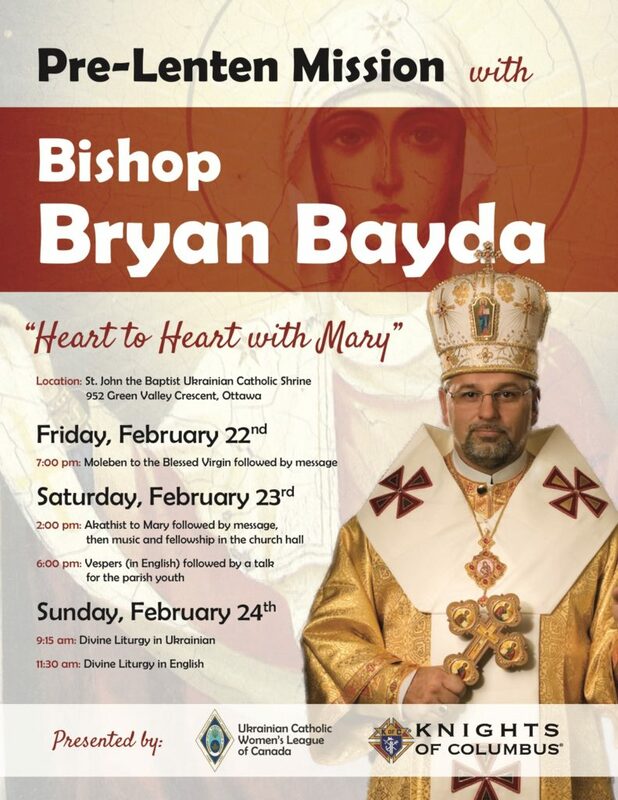 Bishop Bryan Bayda of the Eparchy of Saskatoon will visit Ottawa for a special mission at the shrine, presented by the Ukrainian Catholic Women’s League and the Knights of Columbus. Friday night 7pm: Moleben to Blessed Virgin followed by talk. Saturday afternoon 2pm: Akathist to Mary followed by talk then music and sharing in the church hall. Saturday evening: Vespers ( in English) at 6pm followed by talk for youth followed by their Puschennya. On May 2, 2008, the Holy Father, Pope Benedict XVI, appointed Father Bryan as the fifth Bishop of the Eparchy of Saskatoon for the Ukrainian Greek Catholic Church in Canada. He was ordained as bishop on June 27, 2008 at St. George’s Cathedral in Saskatoon. As a member of the CCCB (Canadian Conference of Catholic Bishops), he has served on the Doctrine Commission and currently on the Catechesis &amp; Evangelization Commission. As a member of the Ukrainian Greek Catholic Church (UGCC) Synod he has been the Youth Liaison and was their representative at the 2018 Papal Synod focusing on the theme: “Youth Faith & Vocational Discernment”.